Do you think the car you will be driving in ten years time will be identical to the one you are driving today? Of course not: technology, lifestyles and consumer expectations are changing at an exponential rate. It is certain that cars in 2024 will be very different, while still performing the same basic function of transporting us from A to B. If automobiles can adapt to changes in technology, lifestyles and consumer expectations while still retaining their core function, why cannot classical music? In fact there is a strong case for saying that although classical music is currently far from dead, it may eventually die like the dinosaurs unless it adapts to its changing environment. Changes in listening habits fuelled by the rise of mobile technologies have dramatically changed the expectations of new classical audiences. The significant difference between the sound heard via headphones from a mobile audio player and the sound heard in a concert hall may explain why classical music is struggling to connect with new young concertgoers. 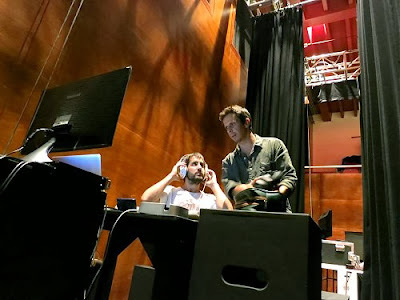 This post explores the differences between the binaural sound of headphones and the live sound of a concert hall, and makes brainstorming suggestions as to how the chasm that has been opened up between recorded classical music and live concerts can be bridged. In the 1960s the introduction of stereo recordings sparked a boom in record sales that introduced composers such as Mahler to a mass market, and that boom quickly spread to the concert hall. Despite this the spatial opportunities offered by new audio technologies remains neglected, and this post is a contribution to rectifying that imbalance. 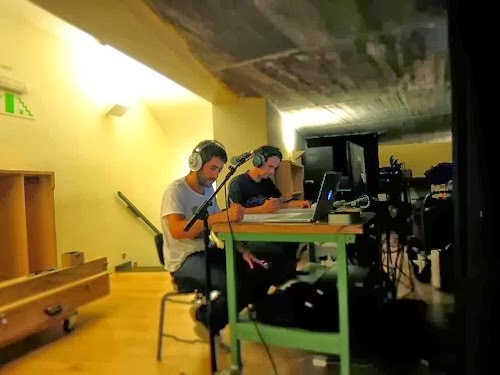 The accompanying photos were taken at an experimental recording session which explored new approaches to sound immersion and localization. A musical instrument has five defining characteristics, pitch, rhythm, tone colour, loudness, spatial location and ambience, and the sound of an orchestra is defined by the complex interaction of all five. The development of stereo, which separates and locates the individual sections within an orchestra, made complex music such as Mahler symphonies comprehensible for the lay listener and sparked the golden age of classical recording in the 1960s and 70s. In that golden age stereo recordings were listened to on domestic audio systems. But new mobile technologies and changing lifestyles mean that is no longer the case. A recent press report confirmed what had been evident for some time, that the huge popularity of mobile audio players means that more people listen to music via headphones than via speakers. This switch from headphones to speakers, which is being accelerated by the convergence of audio players and smartphones, has profound and little understood implications for classical music. Listening to speakers in the living room from the stereo "sweet spot" creates an image spreading the music between the speakers at a distance in front of the listener; but headphone listening, which is fast becoming the de facto standard, creates a very different binaural image which places the music inside the listener's head. Stereo through speakers places the listener in a good seat in the stalls and creates the most authentic listening experience for those who regularly attend classical concerts. But the reference for new audiences is not the concert hall but headphone listening - "heavily compressed, grainy MP3s delivered through perfectly awful earbuds" - and at their first concert neophytes expect the music to be larger than life and inside their heads. Which it is not; because if the new concertgoer buys affordable tickets for a large hall the music will be coming from a considerable distance outside their heads. Listening from the balcony in London's Festival Hall is, for example, the aural equivalent of looking down a telescope the wrong way, while the cheaper seats in the Albert Hall - home of the revered BBC Proms - are even worse. And, as a reader recently pointed out, it is not just newcomers that are disillusioned with the sound in traditional large concert halls. These problems are compounded by current performance conventions which stipulate authentic instruments, small ensembles and no vibrato for pre-Romantic music. There has been much agonising by Universal Music ceo Max Hole and others as to why live classical music does not connect with younger new audiences. But their proposed solutions, such as applause between movements and informal dress, are simply band aids if the sound - the DNA of music - fails to meet expectations. Thomas Merton wisely told us that "Technology is made for man, not man for technology". There is a school of thought, and it is one I have considerable sympathy for, that says that classical music should not be changed to accommodate new audiences; particularly as well-intentioned changes may drive away the all-important core audience. But it is important to gaze into the crystal ball occasionally, even if we do not like what we see there.n And, at this point, let's dismiss the suggestion that what is being discussed in this post is dumbing down. Dumbing down is diluting without changing. What is being discussed here is evolutionary change without diluting the power of the music. Copland's observation that when the audience changes, the music changes has been true throughout the history of classical music. The term 'orchestra' is derived from the Greek word for the space occupied by the chorus and the stage in Ancient Greek theatres; so the original orchestra was a space which over time changed into the instrumental ensemble we know today. The size and layout of modern orchestras, their performance style and the halls they play in are no more than conventions - silly or otherwise - which have all changed over time. And those changing references and expectations are not confined to new audiences: Spotify and other streaming services which impose heavy compression on classical music are widely used and accepted by classical musicians. Giovanni Gabrielli, with his split double choirs, and Gustav Mahler with offstage brass in his Second Symphony are just two of the composers who pioneered using spatial effects to immerse listeners in their music. More recently, heretical solutions such as turning up the bass and introducing amplification to give classical music more slam have been discussed. Contemporary music is better placed to avoid apostasy, and immersive works such as Jonathan Harvey's Mortuos Plango, Vivos Voco for 8 channel tape (created at Boulez's IRCAM studio) and York Höller's Horizont quadraphonic electronic music (created at Stockhausen's Studio für elektronische Musik des WDR) are products of a period in the 1970s and 80s when new music's preoccupation with spatial effects reflected the (unsuccessful) launch of domestic quadraphonic sound. At the time the major record labels hoped that quadraphonic sound would spark another boom mirroring that triggered by the introduction of stereo in the 1960s. This shortlived flirtation with surround sound resulted in Bernstein's controversial 1973 Rite of Spring which, presciently in view of the current hegemony of headphone listening, placed the listener in the middle of the orchestra. More recently Jonathan Harvey has exploited the spatial possibilities offered by sound projection and diffusion in his Speakings for large orchestra and electronics; a work, incidentally, that, after repeated listenings, I have concluded sounds far better on headphones than speakers. Any proposal to bridge the gap between the de facto standard of mobile audio and live concerts in mainstream classical music will, inevitably and understandably, provoke a hostile reaction. But I will commit the ultimate heresy by suggesting a one-off experiment - I repeat one-off - of back-to-back concert performances of, say, Beethoven's Seventh Symphony; with one performance in conventional concert hall mode and one sound projected to place the audience in the middle of the orchestra, thereby providing a valuable guide to (new) audience reaction. 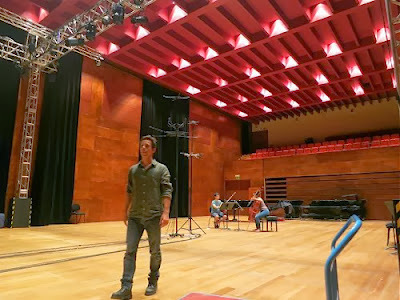 And, staying in heretical mode, it should be possible to use microphones in a concert performance of, say, a Mahler symphony to provide a surround mix (listener in middle of orchestra) made available online in real time in the hall, allowing the audience the choice of listening to the vanilla 'concert' mix with their ears, or to a surround mix using headphones. At the heart of this debate is the question I posed last year of music to listener, or listener to music? Entrenched in classical music orthodoxy is the view that the listener must be brought to the music. But the dramatic changes in technology, listening habits and lifestyles identified earlier dictate that solutions that go some way to bringing music to the listener need to be at least considered. Remixing Beethoven and Mahler is far too radical to be taken seriously, but there are more subtle ways to change the music to accommodate a changing audience. As explained earlier, one of the five parameters that defines musical sounds is ambience, which is a product of reverberation. The optimum reverberation time of around two seconds for a concert hall is a totally artificial construct determined by historical convention, as music played in an anechoic chamber or the open air generates no reverberation. If a more immersive sound is needed to attract new audiences a progressive shift to more intimate acoustics may provide an acceptably nuanced solution. One of the most acoustically involving concert halls in the world, Snape Maltings, combines a classic reverberation time of 2.2 seconds with a relatively small sized auditorium of 11,200 cubic metres seating 700. This combination of warm acoustic and compact size gives the sound a signature combination of clarity and slam, and is mirrored in the new 740 seater Saffron Hall in Essex which has an acoustic masterminded by Paul Gillieron, formerly of Arup Associates - the acoustics practice that voiced Snape Maltings and the new Britten Studio at Aldeburgh. Could a move to smaller more intimate venues - the Festival Hall seats 2500 - be part of a beneficial downsizing for classical music? (That topic demands a post to itself!) In the short term digital variable acoustic systems such as the Carmen system from France's Centre Scientifique et Technique du Bâtiment (CSTB) offer a painless way to make hall acoustics flexible and more involving. Systems such as Carmen specifically enhance reverberation and cannot create surround sound mixes, but future generations of these systems could allowing sound projection to become an optional but integral part of classical concerts. These brainstorming suggestions for bringing the music up close and personal in the concert hall will, inevitably, be controversial. But the record industry has set a clear precedent for breaking the sonic conventions of classical music. I was professionally involved with multi-channel sound while working at EMI in the 1970s, and must confess that the experience left me sceptical about its merits. But the arrival of technically elegant - which 1970s quadraphonics certainly was not - multi-channel systems such as SACD, Blu-ray audio (which supports up to eight lossless audio channels) and FLAC files together with 5.1 headphones and Dolby® Headphone has caused me to rethink my position. 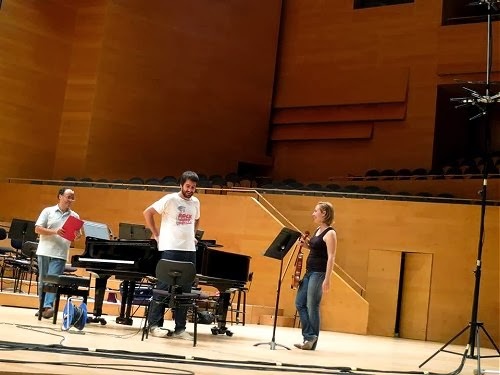 This rethinking has also been prompted by recent exposure to the pioneering work of the Catalan contemporary music label Neu Records. I first mentioned Neu Records in a post about their new release of Ramon Humet's music. For this Neu Records offers a conventional stereo mix on CD and surround sound from HD FLAC surround sound files, giving the consumer the choice of music to listener or listener to music. Auditioning via HD FLAC files and a 5.1 system places the listener in the middle of the London Sinfonietta, and when I wrote about the recording a few months ago I said that I really didn't want to be in the middle of the orchestra. Since making that rather disparaging comment I have come to appreciate that many of classical music's much sought after new audience would like to be among the musicians, because that is where headphone listening places them every day. Subsequent to writing my Ramon Humet post I have enjoyed extended auditioning of the two Neu Records surround sound releases - the other is of Bernat Vivanco's choral music - in conjunction with a very productive discussion with their producer Santi Barguñó. 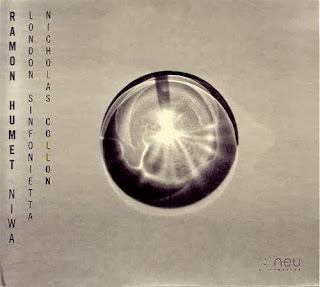 Neu Records are pioneering multi-channel sound and pursuing a vision of, to quote them, "maximising the idea of sound immersion", and the accompanying photos were taken at one of their experimental recording sessions. 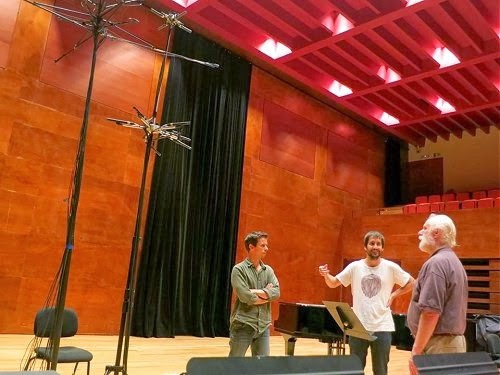 Santi Barguñó laments that nobody is saying anything about Neu Records' involvement with surround sound, and that is very sad, particularly in view of what classical music gets excited about these days. In their manifesto Neu Records state that their aim is "to produce music of our time that creates an impact on the listener" and they share the view of Jonathan Harvey, York Höller, Ramon Humet and others that "playback equipment is a tool that permits the creation and reproduction of acoustic spaces". The first two releases from this enterprising new label show that impact can be created without resorting to technical artifice or commercial gimmickry. Ramon Humet's Niwa is quite simply one of the best sounding and most involving new releases I have heard for a long time, and Neu Record's innovative approach to recording needs to be taken very seriously as it is a genuine attempt to bring classical music up close and personal without compromising artistic excellence. So to conclude I am appending some key points from Santi Barguñó's idiomatic emails. This path may be arcane and lengthy; but, believe me, it is a lot more relevant to attracting new audiences than clicking through the classics or encouraging applause between movements and changing what musicians wear. 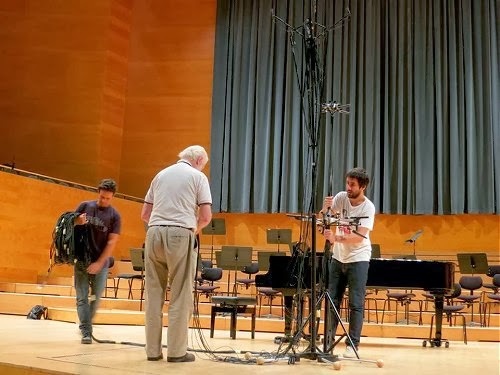 Santi Barguñó writes - We found your comments very interesting about our surround recording approach in Ramon Humet's article (nobody is saying anything about it, and we really need some feedback as your comments). We thought about posting a comment for giving some extra information (if you think it's a good idea) because, as we have seen, what we are explaining about our recording approach is not very clear in our website and booklets. Not all our recordings are placing the listener in the middle of a circle of musicians. In fact, we plan very carefully (in close collaboration with the composers) which pieces could work better with the musicians placed only in the front or also around the listener, but we still think that our recordings are surround recordings in a different way to many other 5.1 albums because we conceive every sound as a surround object, even if it's placed in the front of a surround recording. This is because we are capturing all the natural mixing of direct sound, early reflections, and reverberation tail of each sound in the real acoustics of the venue, and not working on the resonant layers of the sounds as different layers, separated from the direct sound (as many other producers do with artificial added reverberations in the mixing process). All the reverberation is real in our albums, and not a separated object. We are critic of the typical frontal approach in surround recordings because most of that recordings are just "adding" some extra reverberation in the rear channels, without any linking point between the sound images of each pair of stereo segments in a 5 channel surround configuration (formed by 5 different stereo segments that needs to be very well related for producing a real surround image). This depends a lot on the distances and angles between 5 main microphones, and we have been working with Mike Williams (from Audio Engineering Society) for getting the best results we can in terms of surround immersion and localization [see accompanying photos], but it's not necessarily applied in recordings with the musicians around the listener. For example, in Petals, the trio is placed in the front in Niwa, and the other 2 pieces (Jardí de Haikus and Quatre jardins zen) have only percussive elements in the surround channels, planned with the composer for maximizing the idea of sound immersion in a heterophonic japanese garden, which is the basis of both works. Also, we planned how to place the 2 percussionists in the rear part for being completely compatible with the stereo version in terms of phase and image (you listen to that players as if they were placed in a little bit more distant layer of sound in the stereo version), avoiding some specific positions that cause real localization problems rendering a stereo version (as we know that it's the only version of the recordings for almost all our listeners). 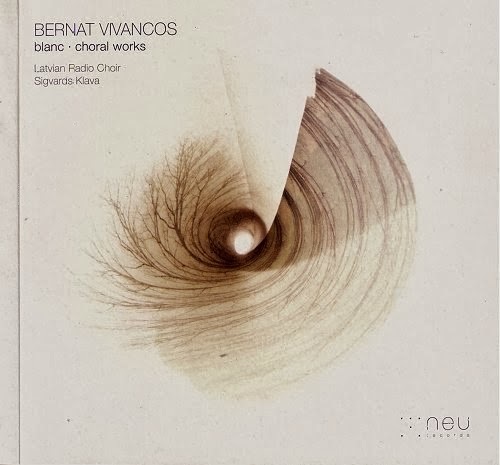 In the case of Blanc, only 3 polychoral pieces are recorded with singers around the listener, Obriu-me els llavis, Bubbles, and Le Cri des Bergers (Vivancos place the singers in the same way in live performances), and the resulting stereo image for the CD is not as rich as the surround one, but not critical at all, as Vivancos wanted to produce the feeling of being inside a sound mass, and not having a precise localization image of each voice (all the different voices were very mixed in the circle for avoiding a precise localization of the different layers and getting a very homogeneous sound mass). As you said, people do not have good surround systems for listening our surround albums, and we are working in a different way for giving sense to our project in terms of surround recording: since we published Blanc, we are organizing surround installation with good speakers in museums (MACBA, Círculo de Bellas Artes,...) and concert halls (Palau de la Música Catalana,...) in Barcelona and Madrid, for 80 people maximum, and it's being very successful here. We think it's a very interesting new way for recorded music. We are writing some texts for our new site about it (ready next February), because outside Spain nobody knows this things, but we are a very small company (only 4 people working), and it's a very slow process! Thank you very much and congratulations for your blog, really necessary and stimulating. Opening quotes are from Less Noise More Soul: The Search for Balance in the Art, Technology, and Commerce of Music edited by David Flitner. Header image via Classic FM, other photos via Neu Records. No review samples or other payment in kind received for this post; I would like to express my thanks to Santi Barguñó for his generous co-operation. Any copyrighted material on these pages is included as "fair use", for the purpose of study, review or critical analysis only, and will be removed at the request of copyright owner(s). Also on Facebook and Twitter. Your posts on audio are always insightful and helpful. It amazes me how little this crucial aspect of music appreciation gets talked about. What you're saying here looks (to me, anyway) to be right on target. There's a huge shift occurring with way more people are knowing music through recordings than live performances - and in the long view - recorded music (and sound reinforcement in the concert hall) is in it's infancy. It all may not go exactly as you're suggesting - but it's going somewhere - and accepting the status quo as how it's always going to be is not helpful. Just based on my own amateur experience setting up sound equipment for performances and recording - it seems to be equally important as the music making itself in determining the effect the music is going to have on the listener. Thank you for this excellent post. If all recordings could be made from my seat on the second viola stand in the orchestra (where, coincidentally I am playing Beethoven's Seventh this week, and really should be practicing the viola part right now rather than making this comment), everyone who is paying attention would understand the way music is put together. Architecture does have a lot to do with music, and the response of the performance space has a lot to do with the way the musicians feel. I have seen (and heard) three performance spaces in my area of Illinois ruined through renovation. Schools (colleges and K-12 schools) engineer their performance spaces for amplified audio rather than to project the stage sound into the audience space. Young people therefore become accustomed to hearing sounds that have been "processed" even during concerts. They also tend to "see" music making as "performing" (which it is to a small degree, but ideally not intentionally, and certainly not exclusively). Someone doing something on stage. What they don't understand is that they (in their musical consumer mentality), are changing the music of their peers by thinking of music in terms of someone doing "something on stage that I am watching." I see this attitude in students who think of their college classes as "someone talking at me about something that I am watching," rather than "someone trying to help me engage with the material." That synapse of engagement needs to be bridged, but I don't really know if there is a "tool" that can do it. Copland is right. When the audience changes, the music changes. Excellent piece, very well thought out and researched, thanks for writing. We need to focus on getting the music out to people. So, the obvious first step is recordings (of varying quality, yes, it's true). The second step, and the more important one, is to stage shows everywhere people are willing to go -- bars, churches, clubs, restaurants, city squares, etc. Seeing is as important as hearing. Once they're hooked on the transfixing live experience, THEN they can upgrade to the full symphony hall effect. Cars represent the best hope for classical. They're equipped with myriad speakers, and you can at least get the sought-after distance effect. Quiet passages are troublesome, but I see the car as the final frontier for good audio. That said, I'll always maintain the listening room, if only to impress people who stop by, who can hear the cleanest, most powerful music right in the "sweet spot." Home stereos have to become retro cool like vinyl. Keep fighting the good fight, comrades. I see this attitude in students who think of their college classes as "someone talking at me about something that I am watching," rather than "someone trying to help me engage with the material." I see this attitude in students who think of their college classes as "someone talking at me about something," rather than "someone trying to help me engage with the material." This is hugely impressive, and may be more than I'm able to digest at one sitting. I've no real background in recorded or even amplified sound, and actually, as I grow older I'm less and less interested in recordings except as a vehicle for hearing repertoire which I could not conceivably get to hear live. Admittedly, I am lucky: working in the business, I have regular access to live performances. This being so, more and more I let my listening be directed by what I can hear live at any given time - almost a "chance" process! Having a large library of recordings, and hearing professional musicians (some world-famous, others less so) regularly, I've come to believe that fame, professionalism and reputation are no guarantors that a given performance will actually speak to me; that it will create that moment of delighted surprise - that intimate, shared, piercing communication - that I think of as "music" (as opposed to mere beautiful sound). I've experienced real music-making in a shaky performance by an undersized amateur choir in a local civic hall; and I've sat through sold-out performances by globally-renowned orchestras under millionaire conductors, and not felt it even once. "Music", for me, is something that happens, more often than not, when the surface cracks. So when I listen to recordings, I'm not over-bothered by sound quality - though I can't bear having music piped directly into my head, and haven't used headphones (except when I'm listening for research purposes and I'd disturb other people by doing so) for over a decade. Music to me is a living process; a physical process, open to the environment and the presence of other people - it doesn't feel right, to me, to experience it in this closed, disembodied way. Soundwaves belong in the air. I think this feeling goes back to my earliest live concert experiences (and my own most intense experiences as an amateur performer) - the physical, tangible excitement of feeling the Liverpool Philharmonic Hall fill with living, all-embracing sound; the "wobble" in my stomach as the double basses dug into the opening bars of a Mahler symphony. Halldor sez: I've come to believe that fame, professionalism and reputation are no guarantors that a given performance will actually speak to me; that it will create that moment of delighted surprise - that intimate, shared, piercing communication - that I think of as "music" (as opposed to mere beautiful sound). I've experienced real music-making in a shaky performance by an undersized amateur choir in a local civic hall; and I've sat through sold-out performances by globally-renowned orchestras under millionaire conductors, and not felt it even once. "Music", for me, is something that happens, more often than not, when the surface cracks. Let me reinforce this message heartily. Hard to know exactly what's meant by "when the surface cracks," but I have a sense that when the usual professional distance breaks down and performers connect with the music and with audiences, magic occurs. I live in a major American city where I've not been to hear the orchestra in five years because my universal experience had been "mere beautiful sound." I uploaded this post with considerable trepidation because I expected that its core proposition, that we must change the way we listen to classical music, would be viewed as heretical. How wrong can you – or rather I – be? The response to date has been universally positive, and that spells out a clear message – the music itself is sacrosanct, but the way we listen to it is not. Halldor sums it up perfectly when he says “in a smaller, less acoustically perfect venue … the music envelops you… the audience is packed closely together, and the physical presence of the sound is overwhelming... I feel this would be far more likely to awaken newcomers to a love of orchestral music - to create that fundamental, visceral connection - than the pristine environment of the “world-class” hall”. By changing the way audiences listen, classical music can build that fundamental, visceral connection. As Brutus says "when the usual professional distance breaks down and performers connect with the music and with audiences, magic occurs". This path opens up a whole new approach to building new audiences, and I believe it represents an exciting and potentially rewarding opportunity. Brutus: "when the usual professional distance breaks down and performers connect with the music and with audiences, magic occurs". Thank you - that's precisely what I meant.